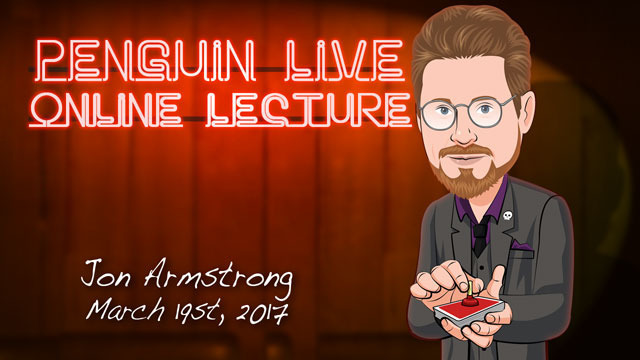 Today, when you order "Jon Armstrong LIVE 2", you'll instantly be emailed a Penguin Magic gift certificate. You can spend it on anything you like at Penguin, just like cash. Just complete your order as normal, and within seconds you'll get an email with your gift certificate. Jon Armstrong LIVE 2 (Penguin LIVE) SUPPORT LIVE MAGIC. DOWNLOAD THE FULL LECTURE TODAY. 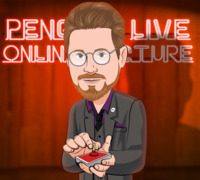 On Sunday, March 19th, anytime after 12:00pm Eastern, click the MyPenguinMagic area at the top of the Penguin site. You'll see the "learn" button appear next to this lecture. Jon Armstrong just keeps getting better and better every time I see him! This lecture is jam packed with ideas, routines and gags that you will use. He is someone who cares so deeply for card magic and it shows because he leaves no stone unturned here. I can recommend this lecture enough! This was a great teaching DVD by Jon. I highly recommend it. Wonderful effects and easy to do. I especially like the coin and bottle routine. His teaching style and presentation is really fun to watch. And on top of all that he's a nice guy too! 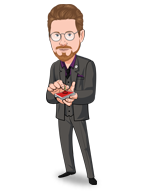 Jon manages to teach effectively and have his personality on full display. This live session is filled with ideas, learning and entertainment which will inspire you! The effects Jon discusses are crowd-pleasing miracles, but the true value is dissecting each performance from the POV of a seasoned and polished touring magician. His insight into why each beat of his performance exists has a value that far exceeds any price associated with the video. For over two hours you step into the mind of one of the most popular working magicians of the modern age. The last ten minutes is filled with surprises as Jon recounts pitfalls and life experiences that shaped his character both on and off stage. Watch this video wearing a diaper because the magic and comedy are amazing enough to guarantee your bladder will fail. This is a lecture for working pros. The material is inspirational. Very direct and powerful effects that you can tell Jon has put a lot of work and effort into. If you are a hobbyist, I'm not sure how much you will get out of this lecture, but if your main focus is on performing clear and impactful effects, you will get a lot out of this lecture. I have seen a lot of lectures, both on Penguin and in person. This rates as in my top five (up there with Tommy Wonder and Eugene Burger). Jon is clear, well prepared, and the material that he teaches is very, very good. Not only that, but the bits he drops in about staging, directing, and making your material better are gold. Dan Harlan says about a quarter of the way through "that is worth the price of the lecture." Dan should know. Get this, and you will be a better performer.